The cache update that was necessary to add the revenant caves is finally ready, so now we're working hard to add the revenants as soon as possible. There's a whole lot going IRL right now which has slowed down the development process, but we keep moving forward nonetheless. We have added a pet store, where you can buy new pets and sell unwanted pets. The store can be accessed at the pet handler west of the Edgeville bank. Selling a pet gives you 10% of the pet points it would cost to buy the pet. Pet points can also be bought in the donator store for 20 donator points each. Ironman players can now donate. However, they only receive a limited set of donator perks and can only purchase cosmetic items and pet points from the donator store. The specific donator perks and store items available to ironman players will be added on the site very soon. You can now purchase platinum tokens in the general store for 1,000 coins each. You can also sell them back for 1,000 coins each. You can now obtain an Olmlet pet from the raids chest. A bug has been fixed where lost darts and Zulrah scales from a blowpipe would only stay on the floor for 2 minutes after death instead of 1 hour. The elder maul now has the correct combat interface. A bug has been fixed that wouldn't allow you to make or charge Arclight at the dark altar if you stood on the north side of the altar. Mac now tells you the right price of the max cape for non-donators (200M). The price was already reduced to 200M in the previous update, but the dialogue text was wrong. Players can no longer attack other players in single combat zones while in combat with an NPC. Teleporting out of the lobby room in Raids no longer results in the loss of raid points. A bug has been fixed where your dwarf multicannon wouldn't always be visible if you leave an area and then walk back. You now have to right-click to pick up a pet, so it will no longer get in the way. Skotizo now drops the Skotos pet, along with the dark claw which can be used to make a purple slayer helmet. Rock crabs and sand crabs now drop a lot of coins and supplies. Several NPC's that didn't drop coins before now drop coins. The droprates of the godsword shards, hilts, armadyl crossbow, staff of the dead, zamorakian spear, bandos boots/chestplate/tassets, armadyl chainskirt/chestplate/helmet for the GWD bosses have been buffed. The droprates of the godsword shards for most GWD boss room minions have been nerfed. The King Black Dragon and skeletal dragons now drop the draconic visage more often. The greater abyssal demon now drops the abyssal whip, head and dagger. The pet droprates for the following bosses have been buffed: King Black Dragon, Chaos Elemental, Kraken, Venenatis, Callisto, Vet'ion, Kree'arra, General Graardor, Zulrah, Thermonuclear Smoke Devil, Cerberus. The pet droprates for the following bosses have been nerfed: Dagannoth Rex, Dagannoth Prime, Dagannoth Supreme, Giant Mole, Nuclear Smoke Devil, Abyssal Sire. Several other NPC's (mostly bosses and NPC's in the wilderness) have also received various drop rate buffs. We are glad to announce the release of our HiScores! Along with this release, we have also increased the XP cap to 1,000,000,000 (1 billion). The first person to get 1B in a skill will always be shown at the top, while the first person to get 1B in all skills will be guaranteed the first spot on the overall HiScores - forever! Kills and deaths in PvP are also tracked. Several bugs were also fixed - please refer to our forums for more details! After a few weeks of hard work, it's finally here: our very own Grand Exchange! You can access the GE through one of the Grand Exchange Clerks that are found in Edgeville - one inside the Edgeville bank (at the south end) and one near Wizard Mizgog. It works pretty much exactly like OSRS, so if you're familiar with the OSRS GE, you'll have no trouble using ours. Simply select an offer slot to start buying or selling, then either type part of an item name to start buying or select an item from your inventory to start selling. Regular players have 4 GE slots, donators have 5, super donators 6, extreme donators 7 and legendary donators have 8 slots at their disposal. Just like OSRS, you can also collect items or coins at any bank booth. 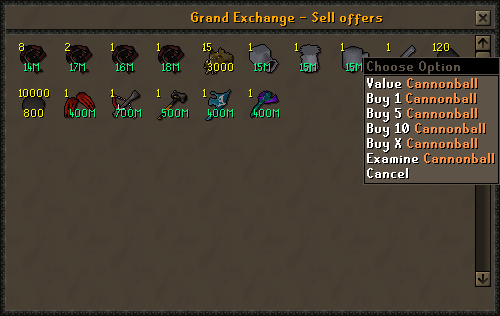 Last but not least, our Grand Exchange also has an extra feature: you can directly access all current buy and sell offers so you can always see what's being bought or sold and at what price (the amount being bought/sold is shown at the top left, the price is shown at the bottom of each item). Not only that, but you can also directly buy or sell items as if it were a shop! 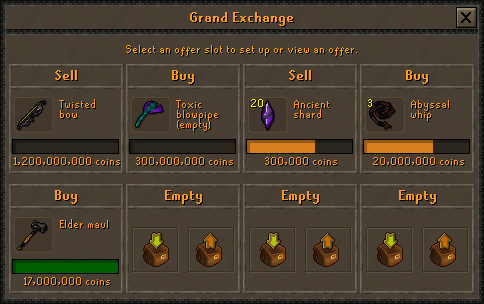 There are only two features missing to make our Grand Exchange the best one around (even more advanced than the one OSRS has) - the ability to collect items to your bank and to search through the history. Those two features will be added in a later update, but for now we will focus our attention to revenant caves and hiscores first! Items will now stay on the floor for one hour after you die, unless you die in PvP. The way our drop tables work has been changed. In the past, whenever you were lucky enough to hit one of the drop tables of an NC (the 'common', 'uncommon', 'rare' or 'very rare' table), you would receive just one random item from that table. This has now been changed, so that every single item has its own independent chance to drop and you can now theoretically receive every item from the drop table in a single kill, which was not possible before. Several rare item drops will also be buffed in an update soon. A bug has been fixed where the drop tables would show 'constant' but the chance would show 1/2 instead of 1/1. The drop tables are now much faster to open and to search through. Whenever you set up a dwarf multicannon, teleport out and back in, you will now see the cannon again. The dragon hunter crossbow now has 30% bonus accuracy and damage against dragons, wyverns and the great olm. All raid bosses now have their appropriate magic level for the twisted bow. Most of the God Wars dungeon bosses and bodyguards, as well as Cerberus now have their appropriate magic level as well. The game now keeps track of how many raid chests you have looted. Several bosses and other NPC's that would ignore protection prayers no longer ignore them. A few NPC's can still deal damage through prayers, but never the full amount. Arclight will no longer bug the altars at Skotizo. The katana has been added to master clue scrolls. All single- and multicombat zones in the wilderness should now be exactly the same as in OSRS. You can now burn redwood logs with the infernal axe. A bug has been fixed where shops would say they would give more coins when buying an item from you than they really do. Walking through the magical wheat at puro-puro should now be much better. There may still be a few spots where you cannot properly walk through, but we're looking into that. The cat lady random event will now occur less often. You can now obtain an ancestral hat, robe top or robe bottom as a rare drop from the Raids reward chest. The dwarf multicannon will no longer be invisible when being set up inside the corporeal beast cave. A bug has been fixed where players were unable to complete certain daily tasks (looting barrows chests, killing raid monsters, playing pest control). Players that are not super donators can now purchase a max cape from Mac for 500M coins. Super donators can purchase it for 10M. When certain items fully degrade, such as an abyssal tentacle, you will now be informed that you can reclaim it at the weird old man in Edgeville. The game used to give you the wrong information by telling you to talk to the wise old man instead. If you are ever stuck in the fight caves due to a noclipping bug, you can now use the Edgeville home teleport to teleport to the entrance of the caves. However, you can only use this once every three minutes. All raid bosses now have a proper magic level set, so the twisted bow should have the correct accuracy and max hit against them. A bug has been fixed where the barbarian agility course wouldn't give XP if you don't jump over the middle section of the last wall. NPC droptables will no longer show a drop chance of 1/1 when it really is 1/2, this was due to a rounding error. Your pet will now properly teleport to you and continue to follow you when you die. Grey and black chinchompas no longer count toward completion of the red chinchompa daily task. A minor bug has been fixed where you might receive the wrong grey, red or black chinchompa pet while hunting. Meanwhile, my work on a grand exchange continues. I've also chosen to make a sort of combination of GE and trading post, so players can see what others have put up for sale and purchase items as if it were a shop. The crystal chest now contains several resources (the sames ones found in the hourly reward boxes), along with ruby bolts (e) and cannon balls. Donators now receive extra items from the crystal chest along with a higher chance on receiving uncommon rewards, depending on their donator rank (see our store for more details). You can now use the crystal chest in Yanille to get items for crystal keys, same place as on OSRS. The chest west of Edgeville bank still works though. A bug has been fixed where you sometimes couldn't click on a bank tab. It is no longer possible to safespot the lizardman shaman. The trident of the swamp now has a magic level requirement of 75. The trident of the seas now has its proper attack and defence bonuses. Whenever the Well of Goodwill is activated, players will now see the appropriate bonus in their quest tab. Same for when the well deactivates again. A bug has been fixed where an hourly reward box would drop on the floor instead of being added to your bank. 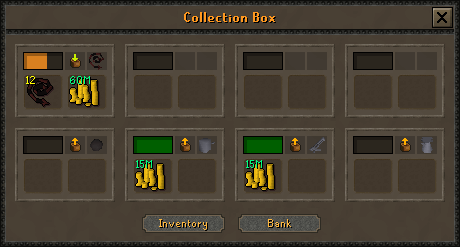 This happened when you have 1 or more boxes in a bank tab that contains 350 items. A bug has been fixed where hourly reward boxes were actually being granted every 36 minutes instead of every hour. The Zamorakian hasta and dragon spear now do regular damage to the Corporeal beast, same for magic attacks. Weapons other than a spear or hasta now do 50% damage to the Corporeal beast, instead of 20%. You can now set up a dwarf multicannon in the Corp cave. The Corporeal beast will now only spawn one single dark core during the fight. You can now properly teleport out of the Skotizo boss room. Skotizo is now more vulnerable to twisted bow attacks. Whenever you use a bone on an altar, you will now automatically use all the bones of that type on the altar, instead of having to specify the amount first. NPC's will no longer drop fractured crystals. They now drop more coins instead. All fractured and newly made crystals still in the game are made untradeable since they are now a discontinued item You can still sell them to the general store though. A bug has been fixed where a compass image is shown near the bottom of the quest tab. When you teleport out of raids, you will now lose 40% of your raid points. Does not apply when you use the stairs to leave the raids. Dragon claws, elder maul and twisted bow now have a higher value on death. The elder maul attack speed has been fixed. The lucky impling will no longer randomly move around, hopefully stopping it from glitching out of the map. Made some changes that should help prevent the sort of massive lag that occurred last night. Extra logging has also been enabled to help prevent this sort of things from happening again in the future. Players should now be able to receive a new daily task after completing the previous one. Thanks to the assistance of a player, we have managed to track down and fix the bug that would freeze the client of some players when they encounter a random event. We can now confirm that this bug is definitively taken care of! I've managed to fix a bug that would cause some players to crash while they get a random event. However, if someone encounters any issues with our random event, please do let us know. We have added a random event in order to stop players from completely AFK'ing skilling activities with a bot, macro or autoclicker. The random event will take you to a mansion, where you are to click on a cat. Once you do, you will be teleported back to your original position and you will receive either coins or an hourly box in your bank as reward. The random event is safe, meaning you cannot die or take any damage. We're hoping that this simple event will be sufficient to stop bots and autoclickers, while not being too interruptive to regular players as it should only take a few seconds to complete. Not to mention that players receive a nice reward after completing it. We are glad to announce the official release of our forums! Instead of the contact page and Discord channels, please use the appropriate forums as of now to communicate with us. We're hoping the forums will enable us to much more efficiently communicate with our community and work in a far more organized manner than before. Unlike the game itself, we do have forum rules. If you wish to apply to become forum moderator, post an application here. The twisted bow now has its proper passive effect, dealing damage based on the enemies magic level. In PvP situations, the bow should now work exactly as on OSRS, in PvM it will work properly against most NPC's, but not against all of them since not every NPC has a proper magic level set. We will set proper NPC magic levels over time, depending on community feedback. Mystery boxes have been added to the donator store, costing 100 points each. There is a 2/3 chance to obtain 70M - 250M coins and a 1/3 chance to obtain a random item that the donator store has or used to have with a value of at least 50 points, including blowpipe, elysian, ags, dclaws, rainbow phat, legendary donator rank etc. The average value of opening a mystery box is 150 donator points, so it is certainly worth its price. The exact contents of the mystery box can also be found on store page's mystery boxes tab. The sets can be exchanged for their parts at the grand exchange clerk at the southern end of the Edgeville bank. Entering a GWD room now requires a killcount of 20 for regular players, 16 for donators, 12 for super donators, 8 for extreme donators and 4 for legendary donators. The GWD teleport at the donator zone now only adds 4 to KC rather than 10. Improved how the dragon claws special attack works, so it is now more accurate and deals the correct amount of damage. Fixed a bug where the Elysian spirit shield wouldn't reduce damage against ranged, magic or dragon breath attacks. Fixed a bug where you weren't able to set up a dwarf multicannon in most places. Wizard Mizgog can now teleport players to the crafting guild, but they can only enter when they have a crafting level of at least 40. Uncut zenyte is now made by using a zenyte shard on a pottery oven. You need a cut onyx in your inventory to do this. A newly made crystal now sells in the general store for 5000 coins. Hourly reward boxes no longer contain any dragon (g) equipment. Those items have been added to the mystery box. Sigmund the merchant is now present near the thieving stalls in Edgeville, who will buy any items you obtain from the stalls. A bug has been fixed where raid or other instance NPC's could not be attacked or would crash your client when attacking by using auto-retaliate. The rewards chest near Yanille can no longer be used to obtain raid rewards. A bug has been fixed where players would sometimes respawn in Varrock after a server update. Grace is now found near the south of Edgeville, who can teleport you to all agility courses. She also sells graceful equipment for marks of Grace, which adds +10% agility XP per worn piece, lowers your chance to fall and lowers your run energy drain. You can also recolour the equipment. Several bugs with the wilderness agility course have been fixed. The wilderness agility course now grants 24K agility XP on completing a lap (600 for extreme players). The barbarian agility course has been improved. Wilderness wall jumping has been improved. A bug has been fixed where players were unable to log in again after they X-logged or disconnected while in combat. Players no longer respawn in the same place as they died. Bandos godsword and dragon warhammer special attacks now work against NPC's to temporarily lower their defence. Karambwan fishing now takes karambwanji from your inventory, so you no longer have to keep adding them to the vessel. A kawabmwanji fishing spot has been added in the wilderness resource area. A bug has been fixed where players would receive one time more fishing XP after they've already stopped fishing. Players can no longer use crown images in clan chat. Flax picking speed has been slightly increased. The dwarf multicannon has been added to the game. It can be bought in the range store for 60M coins or from the donator store for 50 donator points. Ironman mode players can buy it in the ironman shop. 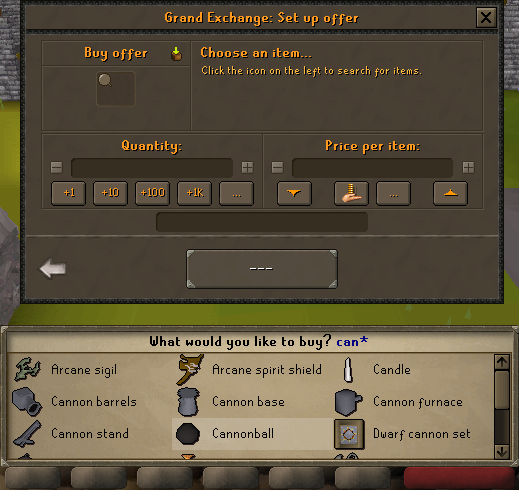 You can exchange the cannon for the set parts at the Grand Exchange clerk that was added in the Edgeville bank by using the set on the clerk. Vice versa, you can exchange cannon parts for a set by using a part on the clerk. Also works for noted items or sets. More item sets will be added later which you can exchange in the same way. Dragon bolt (e) and ruby bolt (e) special effects have been fixed. The city teleports (to Waterbirth, Lletya, Burthorpe, Entrana, Draynor and Trollheim) have been fixed. A few small bugs in the Varrock rooftop agility course have been fixed. Extreme and legendary donators can now reset their slayer task for free. Super donators pay 15 slayer points, while regular players pay 30 slayer points.. Legendary donators can permanently remove a slayer task for 25 slayer points. Extreme donators can do this for 50 slayer points, super donators for 75 slayer points, while donators and regular players need to pay 100 slayer points..
A bug within raids still remained after yesterday\s update, hopefully today's update should take care of it. All donators can note their resources are the wilderness resource area for free. When talking to the donator shopkeeper, you are now shown your total amount donated and how close you are to the next donator rank. Super donators now get 10% bonus XP, extreme donators 20% and legendary donators 30%. GWD killcount for regular players is now 40. Donators need 30, super donators 20, extreme donators 15 and legendary donators 10. Super and extreme donators now get +5 Pest Control points per game, legendary donators get +10. Bonus NPC droprates (stack with row or row i): 2% for donators, 5% for super donators, 10% for extreme donators and 15% for legendary donators. Last but not least, hourly reward boxes are now automatically put into your bank. Many more donator features are coming soon! But first several bugfixes. Fixed multiple bosses spawning in raids. Improved the chances to obtain resources from the raids reward chest. Great Olm has been slightly nerfed. Slayer XP modifier is now x50 instead of x30. Fixed Corporeal beast using melee attacks from a distance, also nerfed his accuracy and defense stats a little. Fixed a bug where you could get stuck when entering the Corporeal Beast entrance. Wizard Mizgog has been moved closer to the Edgeville teleport/spawn location. We have finally managed to get the last major bugs out of Raids and added the appropriate rewards. To get to raids, simply talk to Wizard Mizgog in Edgeville, choose 'Minigames' and then 'Raids'. The more raid points you obtain, the higher your chance to get a unique item from the rewards chest, such as a twisted buckler, dragon sword, dragon hunter crossbow, dragon claws, elder maul, kodai insignia or twisted bow. Please note that the twisted bow does not yet have its passive effect where the max hit depends on your opponent's magic level. If you do not hit the unique loot table, you have a chance to obtain some resources (runes, arrows, ore, gems or herbs). If you do not obtain any resources, you will get some coins instead. Raid points can be carried over between raids, so don't worry if you forgot to loot from the chest at the end. OSRS mode players now have +30% NPC drop rates. Hunter XP modifier is now x30 instead of x20. Fixed a bug where you would often have to click an object twice to use it (especially annoying in agility). The Kodai wand now gives +15% to your magic max hit. Dragon claws and Armadyl godsword special attacks are now more accurate. The well of goodwill now grants one of the following when filled: +20% global XP rate, +20% global NPC drops or double Pest Control points. Several small improvements to the raids will be made in future updates, along with the twisted bow effect. We will also add several new donator perks very soon, so stay tuned for more! Clients would freeze when attempting to teleport to the Clan Wars area. Players could not create a Kodai wand. Dragon claws special attack hit far too high. Double-clicking a ladder would make your character noclip and run far away (bugfix needs to be verified yet). The teleportation wizard in Edgeville no longer walks around, preventing some annoyances. You can now walk right after teleporting somewhere, instead of having to wait 2 seconds. Buffed the agility XP modifier to x 40 (from x 30). Dragon claws have been added to the donator store, costing 300 donator points each. The prices of the Elysian spirit shield, Draconic visage, Blowpipe and a few cosmetics in the donator store have been increased to match their economy value. Fixed the NPC's in the Armadyl boss room (and several other NPC's) not being able to properly follow players. Fixed anglerfish (and possibly other fish types) being fished far too quickly. Fixed runite golems keeping on respawning and creating more and more of them. Starter cash has been lowered to 500K (from 2M). We might decide to further alter XP rates during the next few weeks, based on player feedback. Made some major improvements in the client to make it use far less RAM than before. Ironman mode players can now vote for vote points. Fixed client zoom not working properly with laptop mousepads. Fixed zooming while having a bank or other interface open. Fixed not being able to destroy certain items. Especially annoying for UIM. Fixed not being able to PM players who are not on your friends list. Fixed not being able to use Tab to reply to people who are not on your friends list. Fixed being able to safespot NPC's when standing diagonally from them. Abyssal bludgeon: now costs 120 donator points (from 170). Abyssal dagger: now costs 90 donator points (from 150). We have fixed a few major bugs. Firstly, you can now see your combat level in the combat tab, while also being able to auto-retaliate which you couldn't before. We have also added zoom functionality and fixed a bug where some players were unable to reconnect after being disconnected. Released on 1 January 2019, Lawless distinguishes itself from all other RuneScape Private Servers by not having any set rules. Rather than constantly being careful not to step on a moderator's toes and ending up muted or banned, you can pretty much do and say whatever you want on our RSPS. There are however a few exceptions. Action may be taken when real life laws are being broken or the server's security is at stake, but only if absolutely necessary. Since we are a brand new server, you may expect a couple of bugs in the game which still need to be taken care of. If you encounter one, please use our contact form to let us know and we'll be sure to fix it as soon as possible.